Our next Bridal Flower Open Day will take place on Saturday 20th October 2018 from 10am – 4pm at our premises in Horndean. Our Open Days provide couples and their families with an opportunity to see an extensive selection of Bridal Party & Venue Arrangements and our cold store will be stocked with a wide range of cut flowers. No appointment is necessary and our team will be on hand all day to discuss your specific requirements and show you examples of our work. It has been an exceptionally busy week at Nursery Fresh – it has been lovely seeing so many Flower Arrangers from our local Cathedrals and Churches coming in to buy their Easter flowers from us. We have also dispatched several orders for churches further afield via our overnight delivery service. 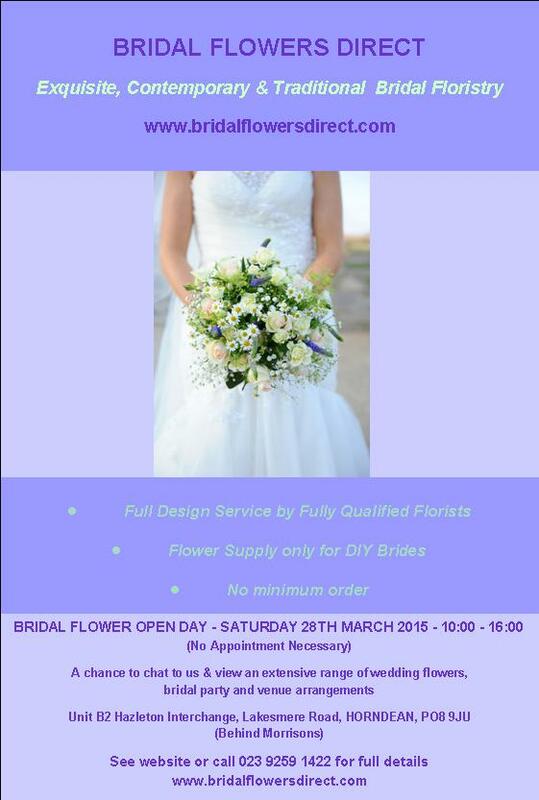 BRIDAL FLOWER OPEN DAY – THIS SATURDAY! Our next Bridal Flower Open Day takes place in a matter of days on Saturday 28th March from 10 a.m. – 4 p.m. at our premises here in Horndean, Hampshire. If you or anyone you know is planning a wedding in the coming months or you have been asked to supply the flower arrangements for a wedding this event is a must. Our warehouse will be full of Bridal Party and Venue Arrangements and our cold store will contain an extensive selection of flowers suitable for weddings. In addition to this our highly experienced staff will be on hand all day to offer any advice you may need. We look forward to welcoming you to what we know will be a fun and most worthwhile day. We are often asked ‘who we are’ and ‘what we do’ so to avoid any confusion here it is in a nut shell. Nursery Fresh Wholesale Flowers is, as the name suggests, a privately run and owned wholesale flower company based in Horndean on the outskirts of Portsmouth. Our location just off the A3(M) enables us to be easily accessed by anyone living or running a business in the Hampshire, Surrey, Berkshire and West Sussex border areas. Our team are extremely knowledgeable about all aspects of the flower industry but most importantly we care about our customers and stand by the quality of our flowers. We do not believe in ‘stock piling’ flowers so whilst we keep our cold store stocked with day to day essentials we prefer to discuss your orders with you and place them directly with our suppliers in Holland. In essence, you let us know what you need and we will buy it in for you, ensuring all the plant material you order will be of the highest and freshest quality. If you live further afield then why not take advantage of our overnight courier service which enables us to send flowers to any address within mainland UK. If you are organising an event at a location away from where you normally live or work the flowers can be sent directly to the venue. The other part of our business is our dedicated bridal and event section – Bridal Flowers Direct. This is a service we have set up which runs alongside the wholesale flower section and enables us to work with Brides and event organisers to supply flowers on either a cut flower only basis or a full design and supply service for those who need additional help and guidance from our experienced floristry team. So basically for whatever reason you may need flowers, from Florists and Flower Arrangers to Brides and Event Organisers we can supply you with flowers of the highest quality and service second to none.